When I purchased the UtechSmart Venus Laser Gaming Mouse (see "UtechSmart Venus Laser Gaming Mouse Review" article), I also looked at the Redragon M901 PERDITION Laser Gaming Mouse. The two mice are basically the same, including the cost (see "Related Links" below). Their resemblance to each other indicates that they came out of the same original equipment manufacturer (OEM). So why did I purchase the UtechSmart Venus Laser Gaming Mouse rather than the Redragon M901 PERDITION Laser Gaming Mouse? The Redragon M901 PERDITION Laser Gaming Mouse is available two different color themes: 1) black and red theme; and 2) white and red theme. 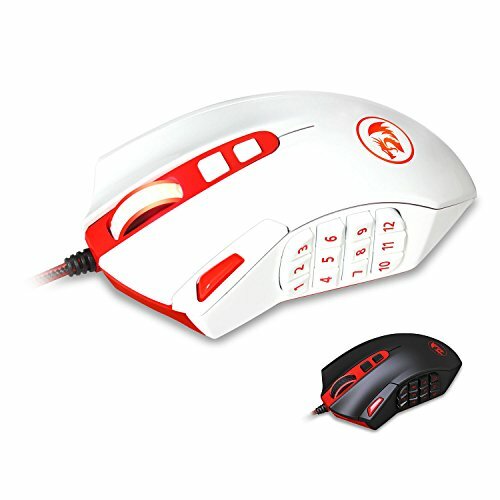 It's probably the only gaming mouse on the market that is available in white (see photo below). If you want a white mouse, the Redragon M901 PERDITION Laser Gaming Mouse wins compared to the UtechSmart Venus Laser Gaming Mouse, which is only available in black, Sword Silver, and Champagne Gold. The button to the left of the index finger button is programmable, which is very similar to the buttons on the original Razer Naga MMOG Laser Gaming Mouse that I own. Except the original Razer Naga has two buttons next to the index finger button. On the Razer Naga MMOG Laser Gaming Mouse, in League of Legends, I map the top button to health potion and map the bottom button to moving the pet. 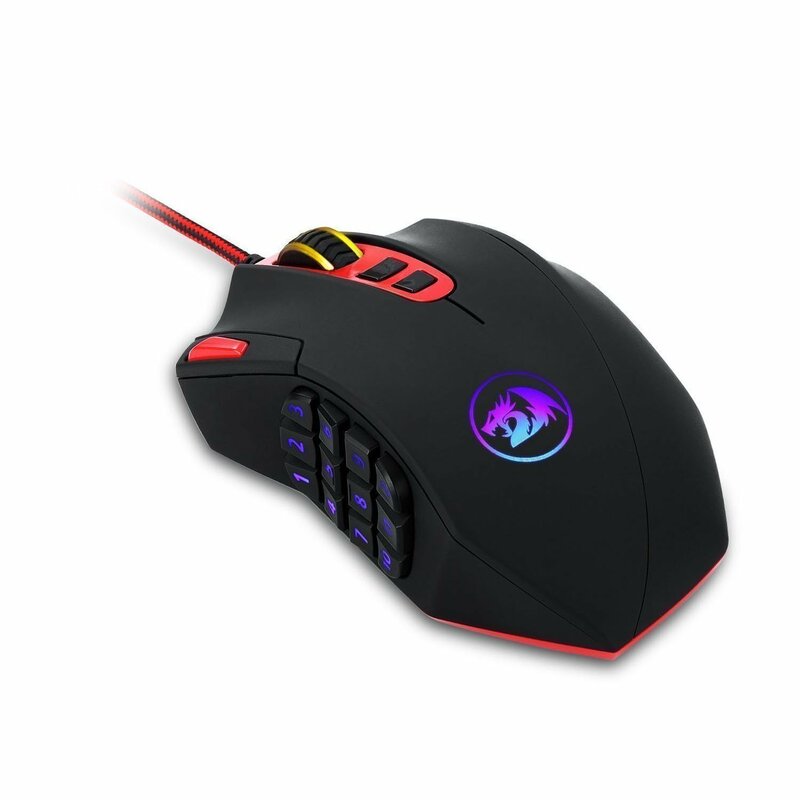 With the Redragon M901 PERDITION Laser Gaming Mouse, I would only be able to map the health potion. In this area, the UtechSmart Venus Laser Gaming Mouse has only one button there as well. 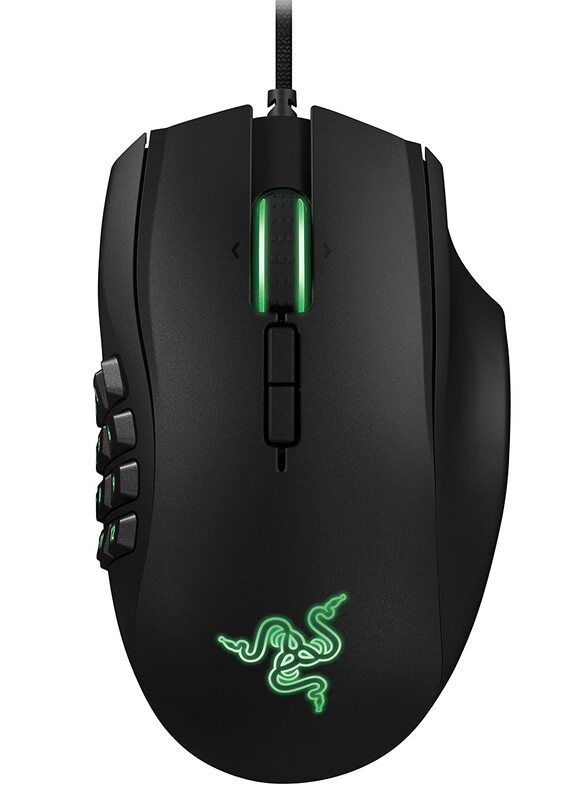 The new Razer Naga MMOG Laser Gaming Mouse no longer has any buttons to the left of the index finger. Therefore, the Redragon M901 PERDITION Laser Gaming Mouse and the UtechSmart Venus Laser Gaming Mouse are now better contenders. 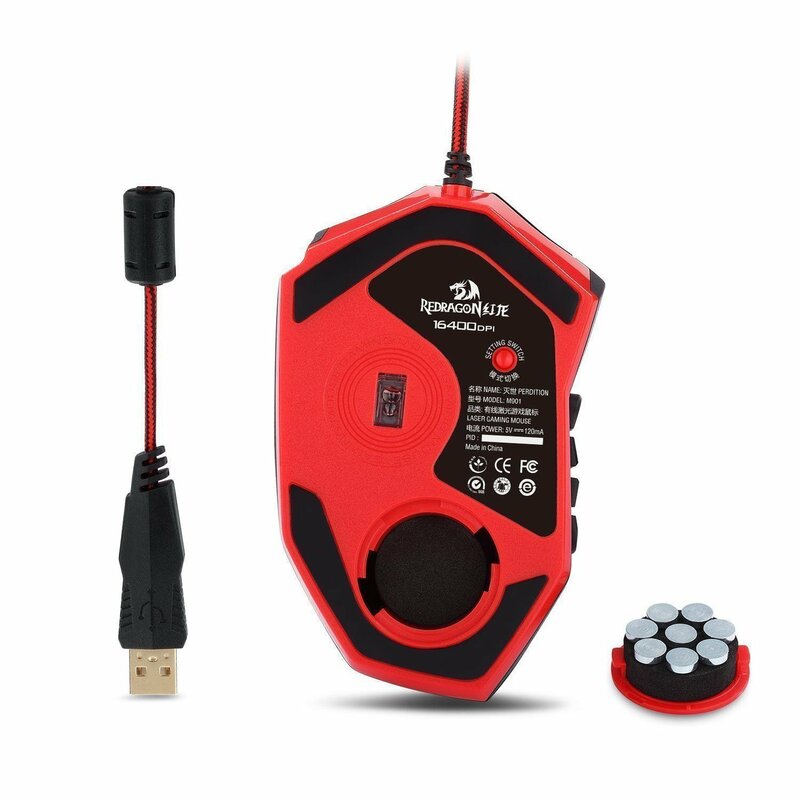 The bottom of the Redragon M901 PERDITION Laser Gaming Mouse has the infrared laser port, a button for you to change profile, two large sliding pads, and a rotating door for adjusting weights (see photo below). You can arrange up to eight weights in any combination. Each metal weight is 2.4g. These features are exactly the same as the UtechSmart Venus Laser Gaming Mouse, which makes me think that they are the same mouse in different bodies. The arrangement of these twelve thumb buttons, plus their shape and angle, seems to be exactly the same as the twelve buttons on the UtechSmart Venus Laser Gaming Mouse. This is another factor that I believe indicate they come from the same designer. UtechSmart Venus Laser Gaming Mouse is more flamboyant than the Redragon M901 PERDITION Laser Gaming Mouse. There are three arrows to the front of each side of it, which just scream, "I'm lit, look at me!" 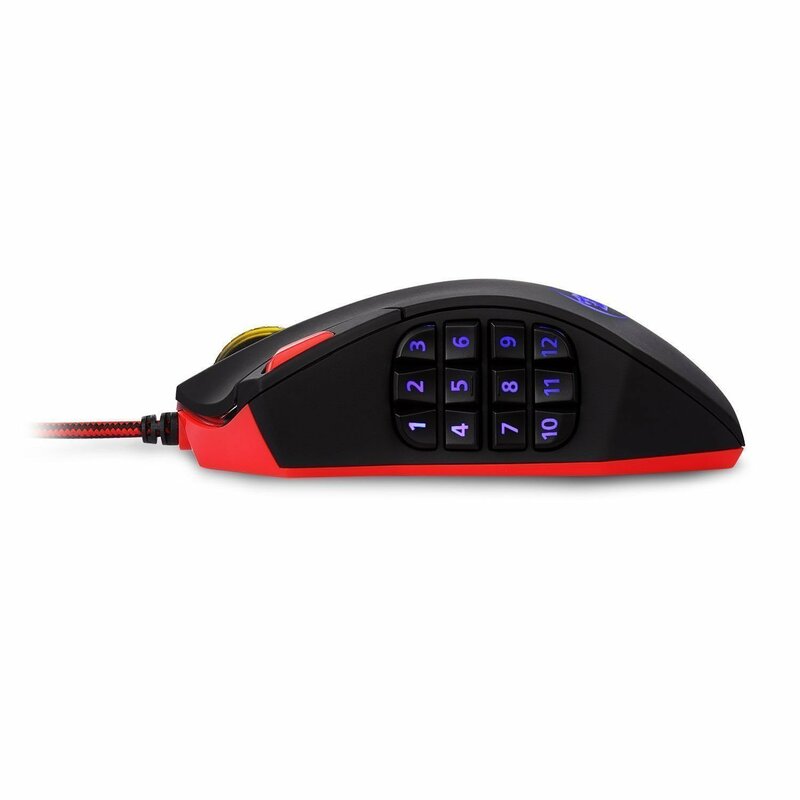 The Redragon M901 PERDITION Laser Gaming Mouse does not have these arrows. It's a better buy if you like a gaming mouse that is toned down. But when everything else on the mouse is lit, why aim for modesty? Plus, you can always turn off all the lights on either mouse. This is another factor I choose the UtechSmart Venus Laser Gaming Mouse. 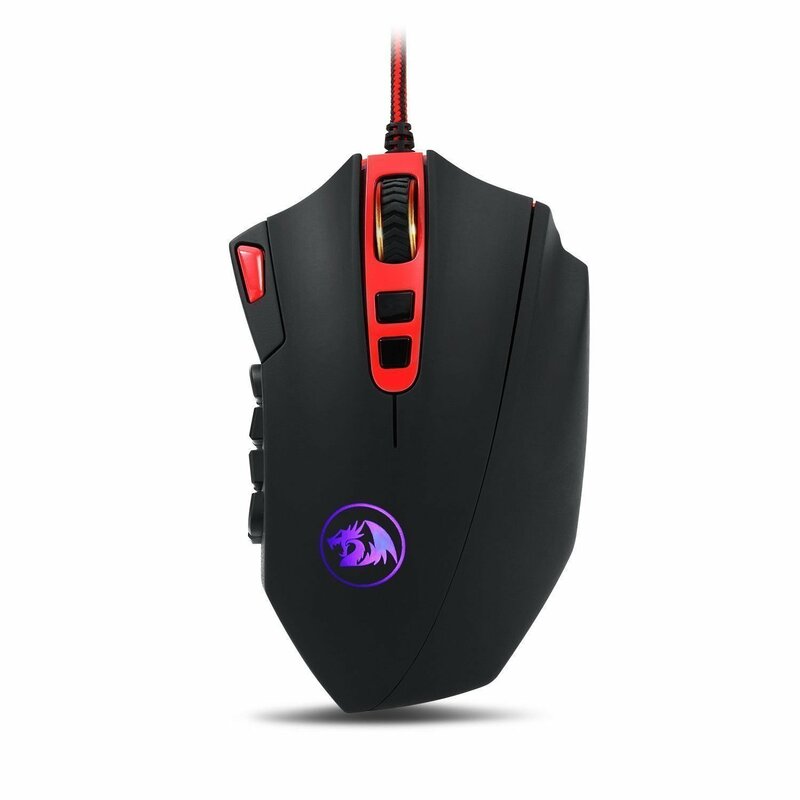 At the time of this writing, the Redragon M901 PERDITION Laser Gaming Mouse costs $35.99. It is much less than the other twelve thumb button gaming mice out there. It is only a few dollars cheaper than the UtechSmart Venus Laser Gaming Mouse, which costs $38.99 at this writing. For three dollars, I am willing to go with the slightly more functional and more flamboyant UtechSmart Venus Laser Gaming Mouse.